The history of New Zealand dates back at least 700 years to when it was discovered and settled by Polynesians, who developed a distinct Māori culture centred on kinship links and land. The first European explorer to sight New Zealand was Abel Janszoon Tasman on 13 December 1642. Captain James Cook, who reached New Zealand in October 1769 on the first of his three voyages, was the first European explorer to circumnavigate and map New Zealand. From the late 18th century, the country was regularly visited by explorers and other sailors, missionaries, traders and adventurers. 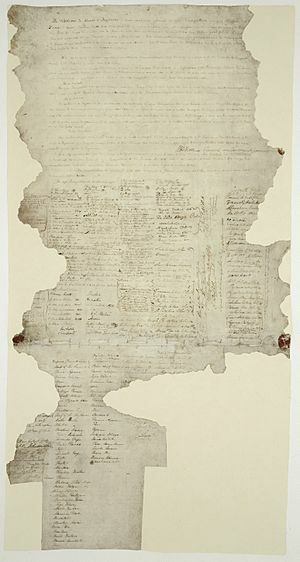 In 1840 the Treaty of Waitangi was signed between the British Crown and various Māori chiefs, bringing New Zealand into the British Empire and giving Māori "equal rights" with British citizens. There was extensive British settlement throughout the rest of the century. War and the imposition of a European economic and legal system led to most of New Zealand's land passing from Māori to Pākehā (European) ownership, and most Māori subsequently became impoverished. From the 1890s the New Zealand parliament enacted a number of progressive initiatives, including women's suffrage and old age pensions. The country remained an enthusiastic member of the British Empire, and 110,000 men fought in World War I (see New Zealand Expeditionary Force). After the war New Zealand signed the Treaty of Versailles (1919), joined the League of Nations, and pursued an independent foreign policy, while its defence was still controlled by Britain. When World War II broke out in 1939, New Zealanders contributed to the defence of the British Empire; the country contributed some 120,000 troops. From the 1930s the economy was highly regulated and an extensive welfare state was developed. Meanwhile, Māori culture underwent a renaissance, and from the 1950s Māori began moving to the cities in large numbers. This led to the development of a Māori protest movement which in turn led to greater recognition of the Treaty of Waitangi in the late 20th century. The country's economy suffered in the aftermath of the 1973 global energy crisis, the loss of New Zealand's biggest export market upon Britain's entry to the European Economic Community, and rampant inflation. In the 1980s the economy was largely deregulated and a number of socially liberal policies, such as decriminalisation of homosexuality, were put in place. Foreign policy involved support for Britain in the world wars, and close relations after 1940 with the United States and Australia. Foreign policy after 1980 became more independent especially in pushing for a nuclear-free region. Subsequent governments have generally maintained these policies, although tempering the free market ethos somewhat. In 1984, the Fourth Labour government was elected amid a constitutional and economic crisis. The economic reforms were led by finance minister Roger Douglas (finance minister (1984–1988), who enacted fundamental, radically neo-liberal and unexpectedly pro-free market reforms known as Rogernomics. 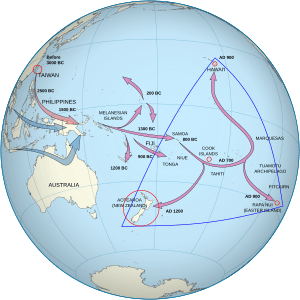 New Zealand was originally settled by Polynesians from Eastern Polynesia. Genetic and archaeological evidence suggests that humans emigrated from Taiwan to Melanesia and then travelled east through to the Society Islands; after a pause of 70 to 265 years, a new wave of exploration led to the discovery and settlement of New Zealand. The most current reliable evidence strongly indicates that initial settlement of New Zealand occurred around 1280 CE. Previous dating of some Kiore (Polynesian rat) bones at 50 – 150 CE has now been shown to have been unreliable; new samples of bone (and now also of unequivocally rat-gnawed woody seed cases) match the 1280 CE date of the earliest archaeological sites and the beginning of sustained, anthropogenic deforestation. The original settlers quickly exploited the abundant large game in New Zealand, such as moa, which were large flightless ratites pushed to extinction by about 1500. As moa and other large game became scarce or extinct, Māori culture underwent major change, with regional differences. In areas where it was possible to grow taro and kūmara, horticulture became more important. This was not possible in the south of the South Island, but wild plants such as fernroot were often available and cabbage trees were harvested and cultivated for food. Warfare also increased in importance, reflecting increased competition for land and other resources. In this period, fortified pā became more common, although there is debate about the actual frequency of warfare. As elsewhere in the Pacific, cannibalism was part of warfare. New Zealand has no native land mammals (apart from some rare bats) so birds, fish and sea mammals were important sources of protein. Māori cultivated food plants which they had brought with them from Polynesia, including sweet potatoes (called kūmara), taro, gourds, and yams. They also cultivated the cabbage tree, a plant endemic to New Zealand, and exploited wild foods such as fern root, which provided a starchy paste. The Abel Tasman map 1644, also known as the Bonaparte Tasman map that is part of the collection of the State Library of New South Wales, Australia. The first Europeans known to reach New Zealand were the crew of Dutch explorer Abel Tasman who arrived in his ships Heemskerck and Zeehaen. Tasman anchored at the northern end of the South Island in Golden Bay (he named it Murderers' Bay) in December 1642 and sailed northward to Tonga following an attack by local Māori. Tasman sketched sections of the two main islands' west coasts. Tasman called them Staten Landt, after the States General of the Netherlands, and that name appeared on his first maps of the country. In 1645 Dutch cartographers changed the name to Nova Zeelandia in Latin, from Nieuw Zeeland, after the Dutch province of Zeeland. It was subsequently Anglicised as New Zealand by British naval captain James Cook of HM Bark Endeavour who visited the islands more than 100 years after Tasman during 1769–1770. Cook returned to New Zealand on both of his subsequent voyages. but historians generally believe the bell 'is not in itself proof of early Tamil contact with New Zealand'. From the 1790s, the waters around New Zealand were visited by British, French and American whaling, sealing and trading ships. Their crews traded European goods, including guns and metal tools, for Māori food, water, wood and flax. Māori were reputed to be enthusiastic and canny traders, even though the levels of technology, institutions and property rights differed greatly, from the standards in European societies. Although there were some conflicts, such as the killing of French explorer Marc-Joseph Marion du Fresne in 1792 and the destruction of the Boyd in 1809, most contact between Māori and European was peaceful. From the early 19th century missionaries began settling in New Zealand and attempting to convert Māori to Christianity and control the considerably lawless European visitors. Pre-European Māori had no distance weapons except for tao (spears) and the introduction of the musket had an enormous impact on Māori warfare. Tribes with muskets would attack tribes without them, killing or enslaving many. As a result, guns became very valuable and Māori would trade huge quantities of goods for a single musket. From 1805 to 1843 the Musket Wars raged until a new balance of power was achieved after most tribes had acquired muskets. In 1835, the peaceful Moriori of the Chatham Islands were attacked, enslaved, and nearly exterminated by mainland Ngāti Mutunga and Ngāti Tama Māori. In the 1901 census, only 35 Moriori were recorded although the numbers subsequently increased. Around this time, many Māori converted to Christianity. The reasons for this have been hotly debated, and may include social and cultural disruption caused by the Musket Wars and European contact. Other factors may have been the appeal of a religion that promotes peace and forgiveness, a desire to emulate the Europeans and to gain a similar abundance of material goods, and the Māori's polytheistic culture that easily accepted the new God. European settlement increased through the early decades of the 19th century, with numerous trading stations established, especially in the North. The first full-blooded European infant in the territory, Thomas King, was born in 1815 at Hohi in the Bay of Islands. Kerikeri, founded in 1822, and Bluff founded in 1823, both claim to be the oldest European settlements in New Zealand after the CMS mission station at Hohi, which was established in December 1814. In 1788 the colony of New South Wales had been founded. According to the future Governor, Captain Arthur Phillip's amended Commission, dated 25 April 1787 the colony of New South Wales included all the islands adjacent in the Pacific Ocean within the latitudes of 10°37'S and 43°39'S which included most of New Zealand except for the southern half of the South Island. In 1825 with Van Diemen's Land becoming a separate colony, the southern boundary of New South Wales was altered to the islands adjacent in the Pacific Ocean with a southern boundary of 39°12'S which included only the northern half of the North Island. However, these boundaries had no real impact as the New South Wales administration had little interest in New Zealand. 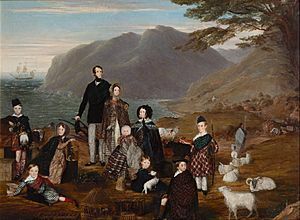 In response to complaints from missionaries, about lawless sailors and adventurers in New Zealand, the British government appointed James Busby as Official Resident in 1832. In 1834 he encouraged Māori chiefs to assert their sovereignty with the signing of the Declaration of Independence in 1835. This was acknowledged by King William IV. Busby was provided with neither legal authority nor military support and was thus ineffective in controlling the European population. In 1839, the New Zealand Company announced its plans to establish colonies in New Zealand. This and the increased commercial interests of merchants in Sydney and London spurred the British to take stronger action. Captain William Hobson was sent to New Zealand to persuade Māori to cede their sovereignty to the British Crown. In reaction to the New Zealand Company's moves, on 15 June 1839 a new Letters patent was issued to expand the territory of New South Wales to include all of New Zealand. Governor of New South Wales George Gipps was appointed Governor over New Zealand. This was the first clear expression of British intent to annexe New Zealand. The European population of New Zealand grew explosively from fewer than 1000 in 1831 to 500,000 by 1881. Some 400,000 settlers came from Britain, of whom 300,000 stayed permanently. Most were young people and 250,000 babies were born. The passage of 120,000 was paid by the colonial government. After 1880 immigration reduced, and growth was due chiefly to the excess of births over deaths. The Māori tribes at first sold the land to the settlers, but the government voided the sales in 1840. Now only the government was allowed to purchase land from Māori, who received cash. The government bought practically all the useful land, then resold it to the New Zealand Company, which promoted immigration, or leased it for sheep runs. The Company resold the best tracts to British settlers; its profits were used to pay the travel of the immigrants from Britain. Because of the vast distances involved, the first settlers were self-sufficient farmers. By the 1840s, however, large scale sheep stations were exporting large quantities of wool to the textile mills of England. 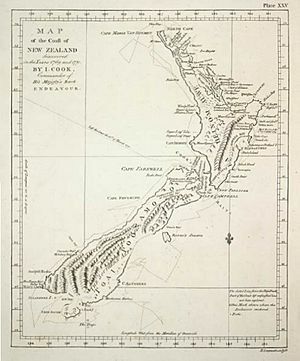 Most of the first settlers were brought over by a programme operated by the New Zealand Company (inspired by Edward Gibbon Wakefield) and were located in the central region on either side of Cook Strait, and at Wellington, Wanganui, New Plymouth and Nelson. These settlements had access to some of the richest plains in the country and after refrigerated ships appeared in 1882, they developed into closely settled regions of small-scale farming. Outside these compact settlements were the sheep runs. Pioneer pastoralists, often men with experience as squatters in Australia, leased lands from the government at the annual rate of £5 plus £1 for each 1,000 sheep above the first 5,000. The leases were renewed automatically, which gave the wealthy pastoralists a strong landed interest and made them a powerful political force. In all between 1856 and 1876, 8.1 million acres were sold for £7.6 million, and 2.2 million acres were given free to soldiers, sailors and settlers. British writer Edward Gibbon Wakefield (1796–1862) exerted a far-reaching influence. His plans for systematic British colonisation focused on a free labour system, in contrast to slavery that existed in the United States and convict labour in Australia. Inspired by evangelical Christianity and abolitionism, Wakefield's essays (1829 to 1849), condemned both slavery and indentured and convict labour, as immoral, unjust, and inefficient. Instead, he proposed a government sponsored system in which the price of farm land was set at a high enough level to prevent urban workers from easily purchasing it and thus leaving the labour market. His colonisation programmes were over-elaborate and operated on a much smaller scale than he hoped for, but his ideas influenced law and culture, especially his vision for the colony as the embodiment of post-Enlightenment ideals, the notion of New Zealand as a model society, and the sense of fairness in employer-employee relations. Although norms of masculinity were dominant, strong minded women originated a feminist movement starting in the 1860s, well before women gained the right to vote in 1893. Middle class women employed the media (especially newspapers) to communicate with each other and define their priorities. Prominent feminist writers included Mary Taylor, Mary Colclough (pseud. Polly Plum), and Ellen Ellis. The first signs of a politicised collective female identity came in crusades to pass the Contagious Diseases Prevention Act. Feminists by the 1880s were using the rhetoric of "white slavery" to reveal men's sexual and social oppression of women. By demanding that men take responsibility for the right of women to walk the streets in safety, New Zealand feminists deployed the rhetoric of white slavery to argue for women's sexual and social freedom. Māori women developed their own form of feminism, derived from Māori nationalism rather than European sources. In 1893 Elizabeth Yates was elected mayor of Onehunga, making her the first woman in the British Empire to hold the office. She was an able administrator: she cut the debt, reorganised the fire brigade, and improved the roads and sanitation. Many men were hostile however, and she was defeated for re-election. Hutching argues that after 1890 women were increasingly well organised through the National Council of Women, the Women's Christian Temperance Union (WCTU), the Women's International League, and the Housewives Union, and others. By 1910 they were campaigning for peace, and against compulsory military training, and conscription. They demanded arbitration and the peaceful resolution of international disputes. The women argued that womenhood (thanks to motherhood) was the repository of superior moral values and concerns and from their domestic experience they knew best how to resolve conflicts. Prior to 1877 schools were operated by the provincial government, churches, or by private subscription. Education was not a requirement and many children did not attend any school, especially farm children whose labour was important to the family economy. The quality of education provided varied substantially depending on the school. The Education Act of 1877 created New Zealand's first free national system of primary education, establishing standards that educators should meet, and making education compulsory for children aged 5 to 15. "First Scottish Colony for New Zealand" – 1839 poster advertising emigration from Scotland to New Zealand. Collection of Kelvingrove Art Gallery and Museum, Glasgow, Scotland. From 1840 there was considerable European settlement, primarily from England and Wales, Scotland and Ireland; and to a lesser extent the United States, India, China, and various parts of continental Europe, including the province of Dalmatia in what is now Croatia, and Bohemia in what is now the Czech Republic. Already a majority of the population by 1859, the number of white settlers (called Pākehā by Māori) increased rapidly to reach a million by 1911. In the 1870s and 1880s, several thousand Chinese men, mostly from Guangdong, migrated to New Zealand to work on the South Island goldfields. Although the first Chinese migrants had been invited by the Otago Provincial government they quickly became the target of hostility from white settlers and laws were enacted specifically to discourage them from coming to New Zealand. HMS North Star destroying Pomare's Pā during the Northern/Flagstaff War, 1845, Painting by John Williams. Māori had welcomed Pākehā for the trading opportunities and guns they brought. However it soon became clear that they had underestimated the number of settlers that would arrive in their lands. Iwi (tribes) whose land was the base of the main settlements quickly lost much of their land and autonomy through government acts. Others prospered – until about 1860 the city of Auckland bought most of its food from Māori who grew and sold it themselves. Many iwi owned flour mills, ships and other items of European technology, some exported food to Australia for a brief period during the 1850s gold rush. Although race relations were generally peaceful in this period, there were conflicts over who had ultimate power in particular areas – the Governor or the Māori chiefs. One such conflict was the Northern or Flagstaff War of the 1840s, during which Kororareka was sacked. As the Pākehā population grew, pressure grew on Māori to sell more land. Land is not only an economic resource, but also one basis of Māori identity and a connection with their ancestor's bones. Land was used communally, but under the mana of chiefs. In Māori culture there was no such idea as selling land until the arrival of Europeans. The means of acquiring land was to defeat another hapu or iwi in battle and seize their land. Te Rauparaha seized the land of many lower North Island and upper South Island iwi during the musket wars. Land was usually not given up without discussion and consultation. When an iwi was divided over the question of selling this could lead to great difficulties as at Waitara. Pākehā had little understanding of all that and accused Māori of holding onto land they did not use efficiently. Competition for land was one important cause of the New Zealand Wars of the 1860s and 1870s, in which the Taranaki and Waikato regions were invaded by colonial troops and Māori of these regions had some of their land taken from them. The wars and confiscation left bitterness that remains to this day. After the conclusion of the Land Wars some iwi, especially in the Waikato, such as Ngati Haua sold land freely. However, only the chiefs and their whanau benefited from this income. The 2013 Ngati Haua treaty settlement recognised that many Ngati Haua had not received any benefit from the large payments in the 1870s hence the government was paying compensation. After the wars, some Māori began a strategy of passive resistance, most famously at Parihaka in Taranaki. Most, such as NgaPuhi and Arawa continued co-operating with Pākehā. For example, tourism ventures were established by Te Arawa around Rotorua. Resisting and co-operating iwi both found that Pākehā desire for land remained. In the last decades of the century, most iwi lost substantial amounts of land through the activities of the Native Land Court. This was set up to give Māori land European-style titles and to establish exactly who owned it. Due to its Eurocentric rules, the high fees, its location remote from the lands in question, and unfair practices by some Pākehā land agents, its main effect was to allow Māori to sell their land without restraint from other tribal members. While the North Island was convulsed by the Land Wars, the South Island, with its lower Māori population, was generally peaceful. In 1861 gold was discovered at Gabriel's Gully in Central Otago, sparking a gold rush. Dunedin became the wealthiest city in the country and many in the South Island resented financing the North Island's wars. In 1865 Parliament defeated a proposal to make the South Island independent by 17 to 31. The South Island contained most of the Pākehā population until around 1900 when the North Island again took the lead and has supported an ever greater majority of the country's total population through the 20th century and into the 21st. Scottish immigrants dominated the South Island and evolved ways to bridge the old homeland and the new. Many local Caledonian societies were formed. They organised sports teams to entice the young and preserved an idealised Scottish national myth (based on Robert Burns) for the elderly. They gave Scots a path to assimilation and cultural integration as Scottish New Zealanders. The prewar era saw the advent of party politics, with the establishment of the Liberal Government. The landed gentry and aristocracy ruled Britain at this time. New Zealand never had an aristocracy but it did have wealthy landowners who largely controlled politics before 1891. The Liberal Party set out to change that by a policy it called "populism." 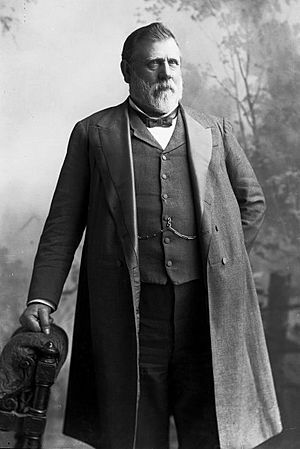 Richard Seddon had proclaimed the goal as early as 1884: "It is the rich and the poor; it is the wealthy and the landowners against the middle and labouring classes. That, Sir, shows the real political position of New Zealand." The Liberal strategy was to create a large class of small land-owning farmers who supported Liberal ideals. The First Liberal government also established the basis of the later welfare state, with old age pensions, developed a system for settling industrial disputes, which was accepted by both employers and trade unions. In 1893 it extended voting rights to women, making New Zealand the first country in the world to enact universal female suffrage. The 1909 Native Land Act allowed the Māori to sell land to private buyers. Māori still owned five million acres by 1920; they leased three million acres and used one million acres for themselves. The Liberals proclaimed success in forging an egalitarian, antimonopoly land policy. The policy built up support for the Liberal party in rural North Island electorates. By 1903 the Liberals were so dominant that there was no longer an organised opposition in Parliament. Coleman argues that the Liberals in 1891 lacked a clear-cut ideology to guide them. Instead they approached the nation's problems pragmatically, keeping in mind the constraints imposed by democratic public opinion. To deal with the issue of land distribution, they worked out innovative solutions to access, tenure, and a graduated tax on unimproved values. Major changes occurred during this decade. The economy grew from one based on wool and local trade to the export of wool, cheese, butter and frozen beef and mutton to Britain, a change enabled by the invention of refrigerated steamships in 1882 and a result of the large market demands overseas. In order to increase production, alongside a more intensive use of factor inputs a transformation of production techniques was necessary. The required capital came mainly from outside of New Zealand. Refrigerated shipping remained the basis of New Zealand's economy until the 1970s. New Zealand's highly productive agriculture gave it probably the world's highest standard of living, with fewer at the rich and poor ends of the scale. In the 1880–1914 era the banking system was weak and there was little foreign investment, so businessmen had to build up their own capital. Historians have debated whether the "long depression" of the late 19th century stifled investment, but the New Zealanders found a way around adverse conditions. Hunter has studied the experiences of 133 entrepreneurs who started commercial enterprises between 1880 and 1910. The successful strategy was to deploy capital economising techniques, and reinvesting profits rather than borrowing. The result was slow but stable growth that avoided bubbles and led to long-lived family owned firms. Historical map of Australia and New Zealand, 1788–1911. Zealandia rejecting Australian Constitution in 1900. New Zealand initially expressed interest in joining the proposed Federation of the Australian colonies, attending the 1891 National Australia Convention in Sydney. Interest in the proposed Australian Federation faded and New Zealand decided against joining the Commonwealth of Australia in 1901, and instead changed from being a colony to a separate "Dominion" in 1907, equal in status to Australia and Canada. In New Zealand, prohibition was a moralistic reform movement begun in the mid-1880s by the Protestant evangelical and Nonconformist churches and the Woman's Christian Temperance Union and after 1890 by the Prohibition League. It never achieved its goal of national prohibition. It was a middle-class movement which accepted the existing economic and social order; the effort to legislate morality assumed that individual redemption was all that was needed to carry the colony forward from a pioneering society to a more mature one. However, both the Church of England and the largely Irish Catholic Church rejected prohibition as an intrusion of government into the church's domain, while the growing labour movement saw capitalism rather than alcohol as the enemy. 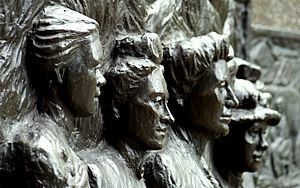 Reformers hoped that the women's vote, in which New Zealand was a pioneer, would swing the balance, but the women were not as well organised as in other countries. Prohibition had a majority in a national referendum in 1911, but needed a 60% majority to pass. The movement kept trying in the 1920s, losing three more referenda by close votes; it managed to keep in place a 6 pm closing hour for pubs and Sunday closing. The Depression and war years effectively ended the movement. The country remained an enthusiastic member of the British Empire, and 110,000 men fought in World War I (see New Zealand Expeditionary Force). 16,688 died. Conscription had been in force since 1909, and while it was opposed in peacetime there was less opposition during the war. The labour movement was pacifistic, opposed the war, and alleged that the rich were benefitting at the expense of the workers. It formed the Labour Party in 1916. Māori tribes that had been close to the government sent their young men to volunteer. Unlike in Britain, relatively few women became involved. Women did serve as nurses; 640 joined the services and 500 went overseas. New Zealand forces captured Western Samoa from Germany in the early stages of the war, and New Zealand administered the country until Samoan Independence in 1962. However Samoans greatly resented the imperialism, and blamed inflation and the catastrophic 1918 flu epidemic on New Zealand rule. The heroism of the soldiers in the failed Gallipoli campaign made their sacrifices iconic in New Zealand memory, and is often credited with securing the psychological independence of the nation. After the war New Zealand signed the Treaty of Versailles (1919), joined the League of Nations and pursued an independent foreign policy, while its defence was still controlled by Britain. New Zealand depended on Britain's Royal Navy for its military security during the 1920s and 1930s. Officials in Wellington trusted Conservative Party governments in London, but not Labour. When the British Labour Party took power in 1924 and 1929, the New Zealand government felt threatened by Labour's foreign policy because of its reliance upon the League of Nations. The League was distrusted and Wellington did not expect to see the coming of a peaceful world order under League auspices. What had been the Empire's most loyal dominion became a dissenter as it opposed efforts the first and second British Labour governments to trust the League's framework of arbitration and collective security agreements. The governments of the Reform and United parties between 1912 and 1935 followed a "realistic" foreign policy. They made national security a high priority, were sceptical of international institutions, and showed no interest on the questions of self-determination, democracy, and human rights. However the opposition Labour Party was more idealistic and proposed a liberal internationalist outlook on international affairs. The Labour Party emerged as a force in 1919 with a Socialist platform. It won about 25% of the vote. However its appeals to working class solidarity were not effective because a large fraction of the working class voted for conservative candidates of the Liberal and Reform parties. (They merged in 1936 to form the National Party.) As a consequence the Labour party was able to jettison its support for socialism in 1927 (a policy made official in 1951), as it expanded its reach into middle class constituencies. The result was a jump in strength to 35% in 1931, 47% in 1935, and peaking at 56% in 1938. From 1935 the First Labour Government showed a limited degree of idealism in foreign policy, for example opposing the appeasement of Germany and Japan. Like most other countries, New Zealand was hard hit by the Great Depression of the 1930s, which affected the country via its international trade, with farming export drops then going on to affect the money supply and in turn consumption, investment and imports. The country was most affected around 1930–1932, when average farm incomes for a short time dipped below zero, and the unemployment rates peaked. Though actual unemployment numbers were not officially counted, the country was affected especially strongly in the North Island. Unlike later years, there were no public benefit ('dole') payments – the unemployed were given 'relief work', much of which was however not very productive, partly because the size of the problem was unprecedented. Women also increasingly registered as unemployed, while Māori received government help through other channels such as the land development schemes organised by Āpirana Ngata. In 1933, 8.5% of the unemployed were organised in work camps, while the rest received work close to their homes. Typical occupations in relief work were road work (undertaken by 45% of all part-time and 19% of all full-time relief workers in 1934, with park improvement works (17%) and farm work (31%) being the other two most common types of work for part-time and full-time relief workers respectively). Attempts by the United-Reform Coalition to deal with the situation with spending cuts and relief work were ineffective and unpopular. In 1935, the First Labour Government was elected, and the post-depression decade showed that average Labour support in New Zealand had roughly doubled comparable to pre-depression times. By 1935 economic conditions had improved somewhat, and the new government had more positive financial conditions. Prime Minister Michael Joseph Savage proclaimed that: "Social Justice must be the guiding principle and economic organization must adapt itself to social needs." The new government quickly set about implementing a number of significant reforms, including a reorganisation of the social welfare system and the creation of the state housing scheme. Labour also gained Māori votes by working closely with the Rātana movement. Savage was idolised by the working classes, and his portrait hung on the walls of many houses around the country. The newly created welfare state promised government support to individuals "from the cradle to the grave", according to the Labour slogan. It included free health care and education, and state assistance for the elderly, infirm, and unemployed. The opposition attacked the Labour Party's more left-wing policies, and accused it of undermining free enterprise and hard work. The Reform Party and the United Party merged to become the National Party, and would be Labour's main rival in future years. However the welfare state system was retained and expanded by successive National and Labour governments until the 1980s. When World War II broke out in 1939, New Zealanders saw their proper role as defending their proud place in the British Empire. It contributed some 120,000 troops. They mostly fought in North Africa, Greece/Crete, and Italy, relying on the Royal Navy and later the United States to protect New Zealand from the Japanese forces. Japan had no interest in New Zealand in the first place; it had already over-reached when it invaded New Guinea in 1942. (There were a few highly publicised but ineffective Japanese scouting incursions.) The 3rd New Zealand Division fought in the Solomons in 1943–44, but New Zealand's limited manpower meant 2 Divisions could not be maintained, and it was disbanded and its men returned to civilian life or used to reinforce the 2nd Division in Italy. The armed forces peaked at 157,000 in September 1942; 135,000 served abroad, and 10,100 died. Cooperation with the United States set a direction of policy which resulted in the ANZUS Treaty between New Zealand, America and Australia in 1951, as well as participation in the Korean War. Fedorowich and Bridge argue that the demands of War produced long-term consequences for New Zealand's relationship with the government in London. The key component was the office of the high commissioner. By 1950 it was the main line of communications between the British and New Zealand governments. A 1943 poster produced during the war. The poster reads: "When war broke out ... industries were unprepared for munitions production. To-day New Zealand is not only manufacturing many kinds of munitions for her own defence but is making a valuable contribution to the defence of the other areas in the Pacific..."
New Zealand, with a population of 1.7 million, including 99,000 Māori, was highly mobilised during the war. The Labour party was in power and promoted unionisation and the welfare state. Agriculture expanded, sending record supplies of meat, butter and wool to Britain. When American forces arrived, they were fed as well. The nation spent £574 million on the war, of which 43% came from taxes, 41% from loans and 16% from American Lend Lease. It was an era of prosperity as the national income soared from £158 million in 1937 to £292 million in 1944. Rationing and price controls kept inflation to only 14% during 1939–45. Over £50 million was spent on defence works and military accommodation and hospitals, including 292 mi (470 km) of roads. Mainstream New Zealand culture was deeply British and conservative, with the concept of "fairness" holding a central role. From the 1890s, the economy had been based almost entirely on the export of frozen meat and dairy products to Britain, and in 1961, the share of New Zealand exports going to the United Kingdom was still at slightly over 51%, with approximately 15% more going to other European countries. This system was irreparably damaged by Britain joining the European Economic Community in 1973, at a time of global economic upheaval regarding energy prices. Britain's accession to the European Community forced New Zealand to not only find new markets, but also re-examine its national identity and place in the world. Māori always had a high birth rate; that was neutralised by a high death rate until modern public health measures became effective in the 20th century when tuberculosis deaths and infant mortality declined sharply. Life expectancy grew from 49 years in 1926 to 60 years in 1961 and the total numbers grew rapidly. Many Māori served in the Second World War and learned how to cope in the modern urban world; others moved from their rural homes to the cities to take up jobs vacated by Pākehā servicemen. The shift to the cities was also caused by their strong birth rates in the early 20th century, with the existing rural farms in Māori ownership having increasing difficulty in providing enough jobs. Māori culture had meanwhile undergone a renaissance thanks in part to politician Āpirana Ngata. World War II saw the beginning of a mass Māori migration to the cities, and by the 1980s 80% of the Māori population was urban, in contrast to only 20% before the war. The migration led to better pay, higher standards of living and longer schooling, but also exposed problems of racism and discrimination. By the late 1960s, a protest movement had emerged to combat racism, promote Māori culture and seek fulfilment of the Treaty of Waitangi. Urbanisation proceeded rapidly across the land. In the late 1940s, town planners noted that the country was "possibly the third most urbanised country in the world", with two-thirds of the population living in cities or towns. There was also increasing concern that this trend was badly managed, with it being noted that there was an "ill-defined urban pattern that appears to have few of the truly desirable urban qualities and yet manifests no compensating rural characteristics." The country's economy suffered in the aftermath of the 1973 global energy crisis, the loss of New Zealand's biggest export market upon Britain's entry to the European Economic Community, and rampant inflation. Robert Muldoon, Prime Minister from 1975 to 1984, and his Third National government responded to the crises of the 1970s by attempting to preserve the New Zealand of the 1950s. He attempted to maintain New Zealand's "cradle to the grave" welfare state, which dated to 1935. His government sought to give retirees 80% of the current wage, which would require large-scale borrowing; critics said it would bankrupt the treasury. Muldoon's response to the crisis also involved imposing a total freeze on wages, prices, interest rates and dividends across the national economy. His conservatism and antagonistic style exacerbated an atmosphere of conflict in New Zealand, most violently expressed during the 1981 Springbok Tour. In the 1984 elections Labour promised to calm down the increasing tensions, while making no specific promises; it scored a landslide victory. However, Muldoon's Government was not entirely backward looking. Some innovations did take place, for example the Closer Economic Relations (CER) free-trade programme with Australia to liberalise trade, starting in 1982. The aim of total free trade between the two countries was achieved in 1990, five years ahead of schedule. "Between 1984 and 1993, New Zealand underwent radical economic reform, moving from what had probably been the most protected, regulated and state-dominated system of any capitalist democracy to an extreme position at the open, competitive, free-market end of the spectrum." The economic reforms were led by finance minister Roger Douglas (finance minister (1984–1988), who enacted fundamental, radically neo-liberal and unexpectedly pro-free market reforms known as Rogernomics. This involved removing many of the favours and barriers that had long insulated the economy from world trends. It involved floating the New Zealand dollar, cutting government spending, reducing most taxes and introducing a sales tax (GST), and removing most subsidies. Rogernomics resembled the contemporaneous policies of Margaret Thatcher in Britain and Ronald Reagan in the US Rogernomics was a rapid programme of deregulation and public-asset sales. Subsidies were phased out to farmers and consumers. High finance was partly deregulated. Restrictions on foreign exchange were relaxed and the dollar was allowed to float and seek its natural level on the world market. The tax on high incomes was cut in half from 65% to 33%. The shares exchange entered a bubble, which then burst. Shares had a total value of $50 billion in 1987 and only $15 billion in 1991; Belich says that at one point the crash was "the worst in world." Overall the economic growth fell from 2% a year to 1%. Strong criticism of Rogernomics came from the left, especially from Labour's traditional union and leftist support-base; Lange broke with Douglas's policies in 1987; both men were forced out and Labour was in confusion. The Fourth Labour Government also revolutionised New Zealand's foreign policy, making the country a nuclear-free zone and effectively leaving the ANZUS alliance. Immigration policy was liberalised, allowing an influx of immigrants from Asia. Previously most immigrants to New Zealand had been European and especially British, apart from some migrants from other Pacific Islands such as Samoa. Voters unhappy with the rapid speed and far-reaching extent of reforms elected a National government in 1990, led by Jim Bolger. However the new government continued the economic reforms of the previous Labour government, in what was known as Ruthanasia. Unhappy with what seemed to be a pattern of governments failing to reflect the mood of the electorate, New Zealanders in 1992 and 1993 voted to change the electoral system to Mixed Member Proportional (MMP), a form of proportional representation. New Zealand's first MMP election was held in 1996. Following the election National was returned to power in coalition with the New Zealand First Party. With the end of the Cold War in 1991, the nation's foreign policy turned increasingly to issues of its nuclear-free status and other military issues; its adjustment to neoliberalism in international trade relations; and its involvement in humanitarian, environmental, and other matters of international diplomacy. The Fifth Labour government led by Helen Clark was elected in 1999. It maintained most of the previous governments' economic reforms – restricting government intervention in the economy much more so than previous governments – while putting more of an emphasis on social policy and outcomes. For example, employment law was modified to give more protection to workers, and the student loan system was changed to eliminate interest payments for New Zealand resident students and graduates. Helen Clark's Labour government remained in power for nine years before being replaced in 2008 by New Zealand's Fifth National government led by John Key. New Zealand retains strong but informal links to Britain, with many young New Zealanders travelling to Britain for their "OE" (overseas experience) due to favourable working visa arrangements with Britain. Despite New Zealand's immigration liberalisation in the 1980s, Britons are still the largest group of migrants to New Zealand, due in part to recent immigration law changes which privilege fluent speakers of English. One constitutional link to Britain remains – New Zealand's head of State, the Queen in Right of New Zealand, is a British resident. However, British imperial honours were discontinued in 1996, the Governor-General has taken a more active role in representing New Zealand overseas, and appeals from the Court of Appeal to the Judicial Committee of the Privy Council were replaced by a local Supreme Court of New Zealand in 2003. There is public debate about whether New Zealand should become a republic, and public sentiment is divided on the issue. John Key led the National Party to victory in both the November 2008 and the November 2011 general elections. Key leads the Fifth National Government of New Zealand which entered government at the beginning of the late-2000s recession in 2008. In his first term, Key's government implemented a GST rise and personal tax cuts. In February 2011, a major earthquake in Christchurch, the nation's second largest city, significantly impacted the national economy and the government formed the Canterbury Earthquake Recovery Authority in response. In its second term, Key's government announced a policy of partial privatisation of state-owned assets. In foreign policy, Key announced the withdrawal of New Zealand Defence Force personnel from their deployment in the war in Afghanistan, signed the Wellington Declaration with the United States and pushed for more nations to join the Trans-Pacific Strategic Economic Partnership. Tourism and agriculture are now the major industries that contribute to New Zealand's economy. The traditional agricultural products of meat, dairy and wool has been supplemented by other products such as fruit, wine and timber. History of New Zealand Facts for Kids. Kiddle Encyclopedia.